Welcome to my faux barn. It is my submission for the weekly photo group called SAPCC. The theme for week #5 was “Fur”. My first response upon hearing this theme was to laugh. I don’t know why. Fur is not an inately funny subject. If it had been “chicken” or “donkey”, I might understand why I laughed. But, “fur”? Anyway, I decided right then and there that my submission whatever it was would be guided by humor. At first, I went the conventional route. I stalked a neighborhood cat with my camera until he got tired of me lurking and turned on me and started charging at my legs. End of my funny fur cat idea. So, one early morning as I was driving around with camera looking for anything that caught my eye with no thought of fur photos, I drove into Sherborn, Massachusetts and turned a corner on Farm Road and there was this barn with the cow peeking out, wait…wait…that’s not a real cow…sound of brakes being applied on a sleepy autumn morning. I took the photograph and read that it had been painted by someone whose business is called “Faux Works”. I got home and realized I had my submission but I had a few things to do to make it my own vision of Faux Fur Cow. 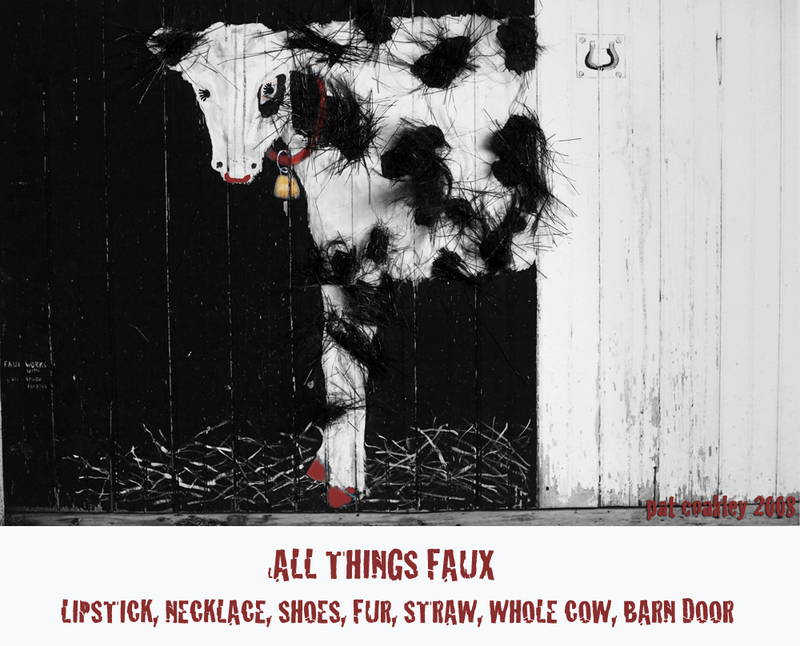 Sherborn has become a town of swells, if you know what I mean, so I decided to add red lipstick to match Madame Cow’s necklace and gave her shoes to match and fake eyelashes. Important in all things swell is that you match and have long eyelashes. And, of course, her black spots I consider “fur” but I thought maybe the group might say, “Nay, nay, cows don’t have furs they have hides”, so these spots of hide are now covered with snippets of black faux fur cut from the neck of an old black sweater coat that hung in my closet. After doing my gluing to the original photo and then rephotographing and then adding the lipstick and accessories, I gave her a name–Ruby. I kept thinking of that Kenny Rogers song, “Ruby, Don’t Take Your Love to Town”. Even if you are a “swell’ and specialize in all things faux, you still need to be loved and admired. You never cease to amaze me. Once again, you have taken it to the next level. WOW! I love Ruby and all of the effort you put into making her come to life. How big was the print you made? This is amazing. Oh, Razz, I can’t imagine you doing this type of photograph in a million, gazillion years…although, wait a minute…you did do “Lessanx”!! Yes, Sweetiegirz, I think she is flirting as she certainly caught my eye as I rounded the corner! Conni, I love themes and a deadline, what can I tell you? Plus, I’d do just about anything rather than live in the real world these days, so what’s a few bare patches in a sweater coat? The print I made was 8X10. Thanks so much for your enthusiasm! I look forward to finding out the theme for next week and seeing what all of us do. Pat! Once again I’m diggin what you’re serving. This is brilliant! Russ! Phobias for next week? Now, THAT’S brilliant. Wow. Very cool. And I feel soundly outworked on this week’s SAPCC. What’s the difference between a dairy cow and Sarah Palin ? Dairy cows know how to apply lipstick !!! I wonder what she’s wearing behind the barn door? Mt. Brooks, the week following a vacation is traditionally punishment for going on vacation, right? Nkgee: Don’t you be putting Sarah in the same category as my Ruby. Sarah shoots moose and wears glasses maybe one day she’ll think Ruby is a moose. Or, else, a blue state. Can’t we girls have a moment peace from ‘you betcha’? Planetross: get your mind out of the barn. As some farmer somewhere must have said. Pat you definitely win the prize on this one. The effort alone is inspiring. Your cow is hilarious – black eye, lipstick, odd fur sticking out all over, it even looks hungover. It’s like it got into a fist-and-electric-trimmer fight at the bar the night before. Too much, TOO MUCH! I love it! A cow called Ruby? Wearing LIPSTICK? You should send this to a Mardi Gras and ask them to use it as their advertisement flyer. For dollars, of course!